1894 10c. 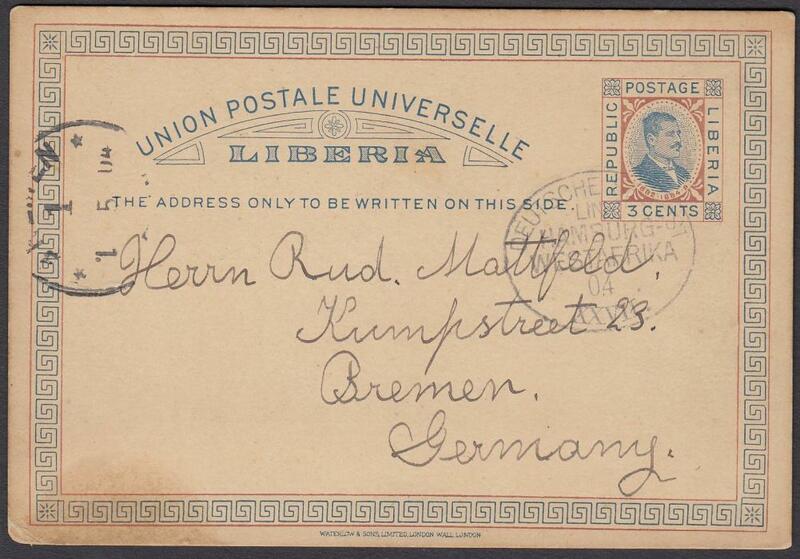 postal stationery envelope to Germany cancelled by oval 'DEUTSCHE SEEPOST/LINIE HAMBURG WESTAFRIKA XXII' date stamp. 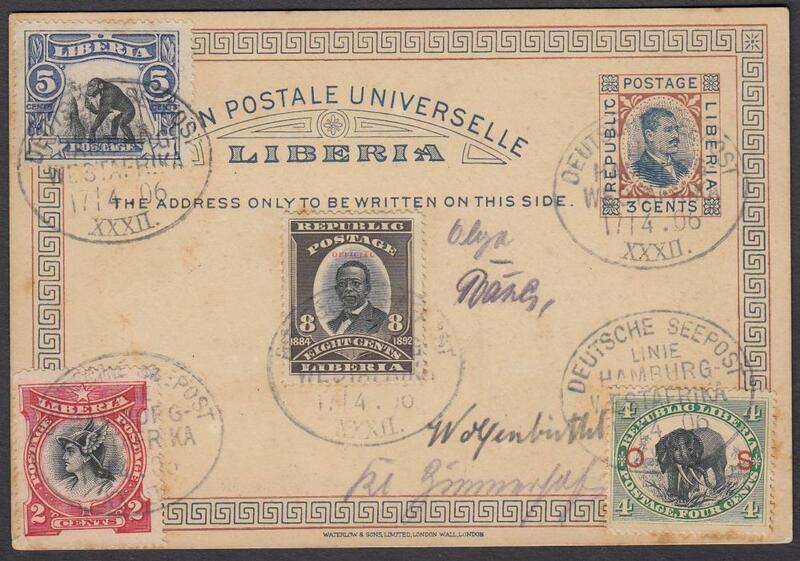 1900 colour picture post card 'Factory on the Kamerun River' to Germany with stamps each tied by oval 'DEUTSCHE SEEPOST/LINIE/HAMBURG/WESTAFRIKA/XIX' date stamps; arrival cds bottom left. 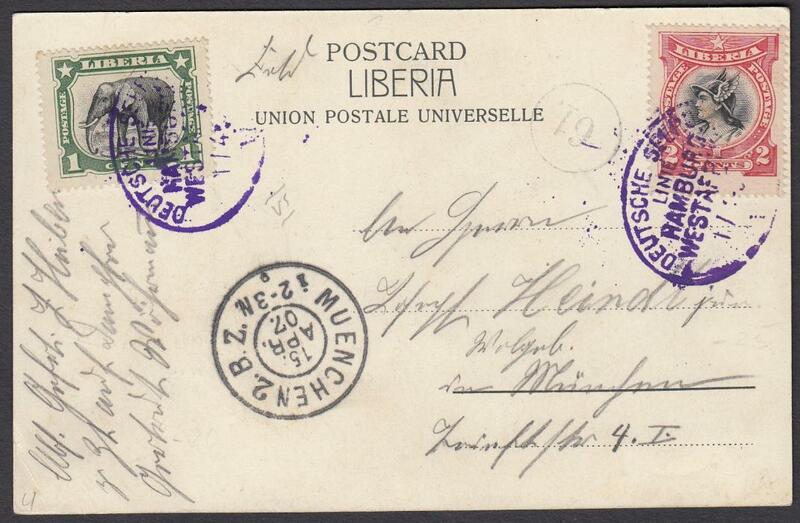 1901 picture post card of Kamerun to Germany franked 1c. & 2c. 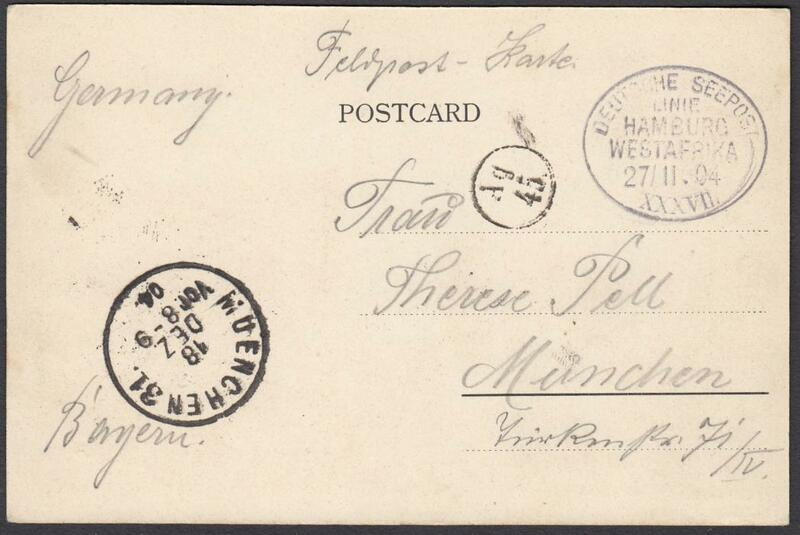 tied oval 'DEUTSCHE SEEPOST/LINIE/HAMBURG/WESAFRIKA/XXI' date stamp. Much re-directed on arrival in Germany with extra piece of paper affixed to card to allow for this; some slight damage to front of card. 1904 3c. 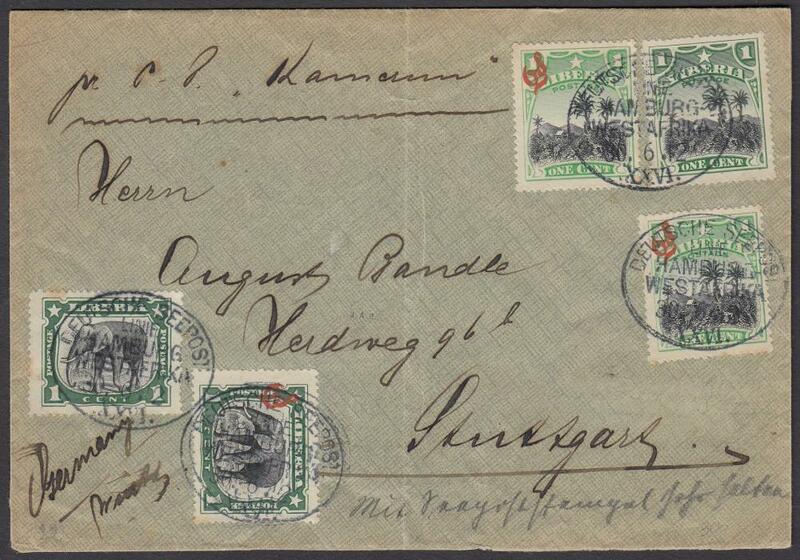 postal stationery card to Germany cancelled by oval 'DEUTSCHE SEEPOST/LINIE/HAMBURG/WESTAFRIKA/04/XXVII' date stamp, BREMEN arrival cds at left. The card is datelined "S.S. Gretchen Bohlen". Cockerill does not record this date stamp tied to the 'S.S. Gretchen Bohlen'. 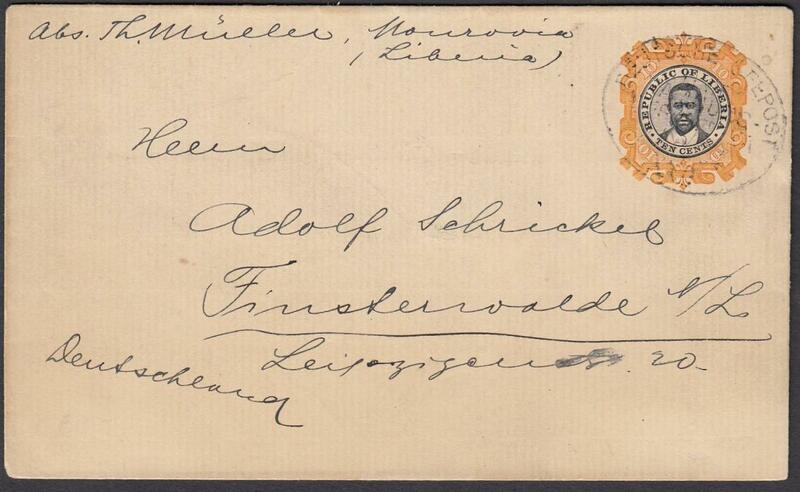 1904 picture post card of Monrovia troops addressed to Germany, endorsed "Feldpost" with oval 'DEUTSCHE SEEPOST/LINIE/HAMBURG/WESTAFRIKA/27/11.04/XXXVII' date stamp, MUNICH arrival cds to left; good condition. 1905 'Woermann Line' picture post card to Germany with adhesives tied by oval 'DEUTSCHE SEEPOST/LINE/HAMBURG/WESTAFRIKA/XXV' date stamps; re-directed on arrival. 1906 3c. 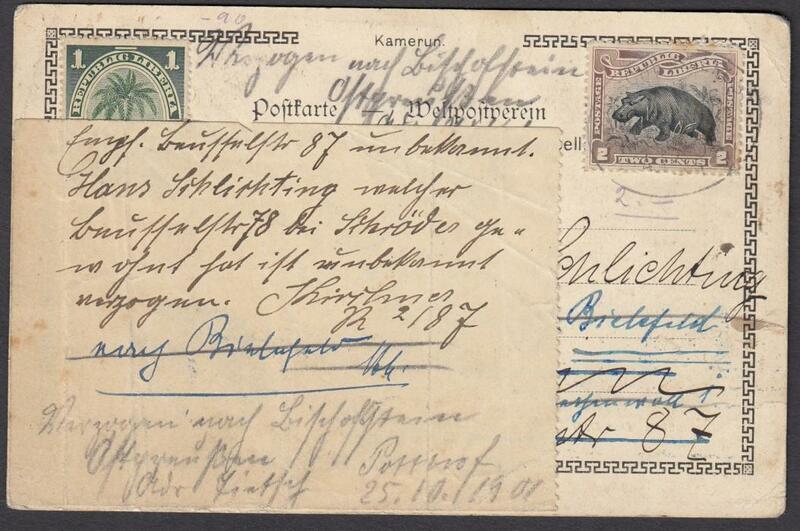 postal stationery card to Germany up-rated 20c., tied 'MONROVIA' cds, oval 'DEUTSCHE SEEPOST/LINIE/HAMBURG/WESTAFRIKA/VII' date stamp alongside; arrival cds at left. 1906 3c. postal stationery card up-rated to Germany with image and stamps each tied oval 'DEUTSCHE SEEPOST/LINIE/HAMBURG/WESTAFRIKA/XXXII' date stamps; blank on reverse. 1907 10c. 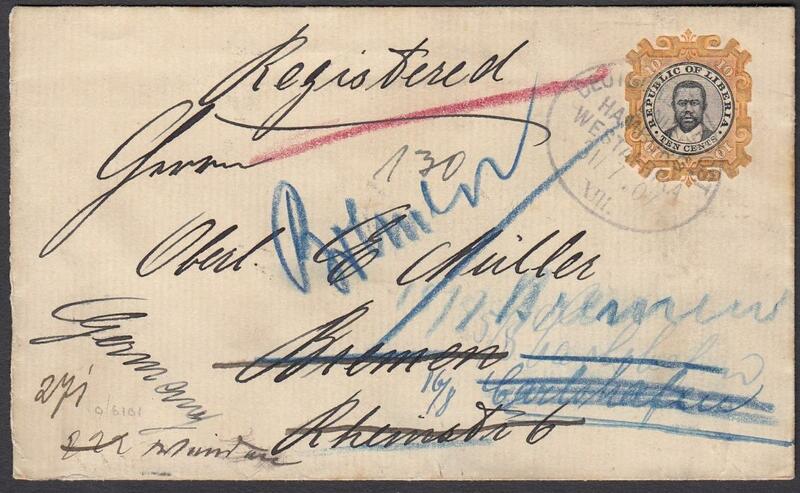 registered postal stationery envelope to Germany with image tied by oval 'DEUTSCHE SEEPOST/LINIE/HAMBURG/WESTAFRIKA/31/7.07/XIII' date stamp, re-directed from Bremen to Hannover. 1907 3c. 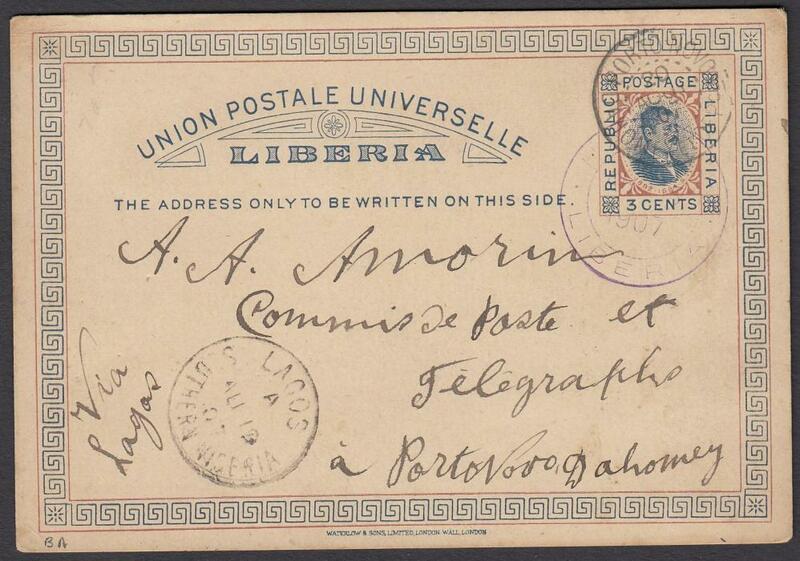 postal stationery card to DAHOMEY cancelled violet 'HARPER' cds, LAGOS, Southern Nigeria transit and PORTO NOVO arrival cds also over stamp image; generally good condition. 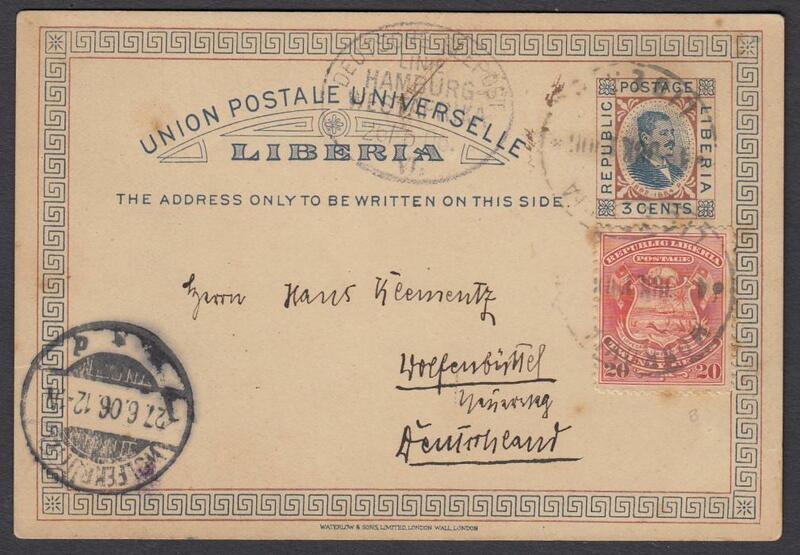 1907 picture post card to Germany with stamps cancelled by oval 'DEUTSCHE SEEPOST/LINIE/HAMBURG/WESTAFRIKA' date stamp with unclear roman numeral. Arrival cancel at base. 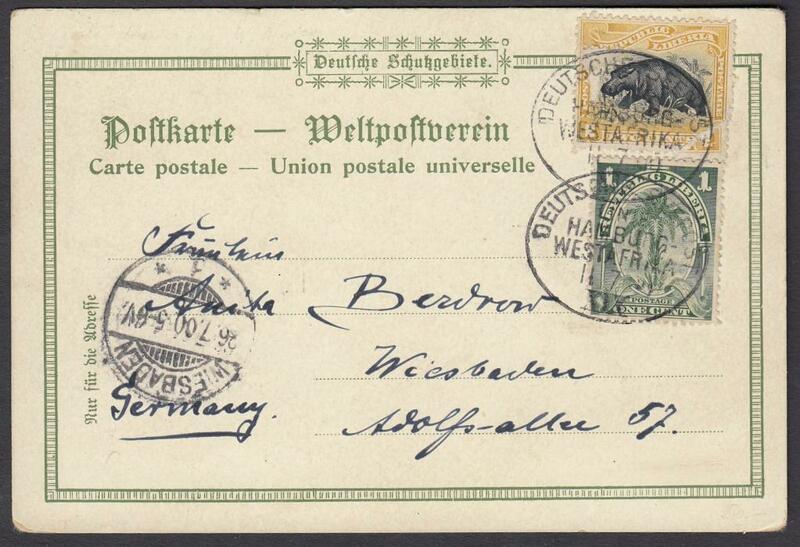 1909 cover to Germany bearing single franking 5c. 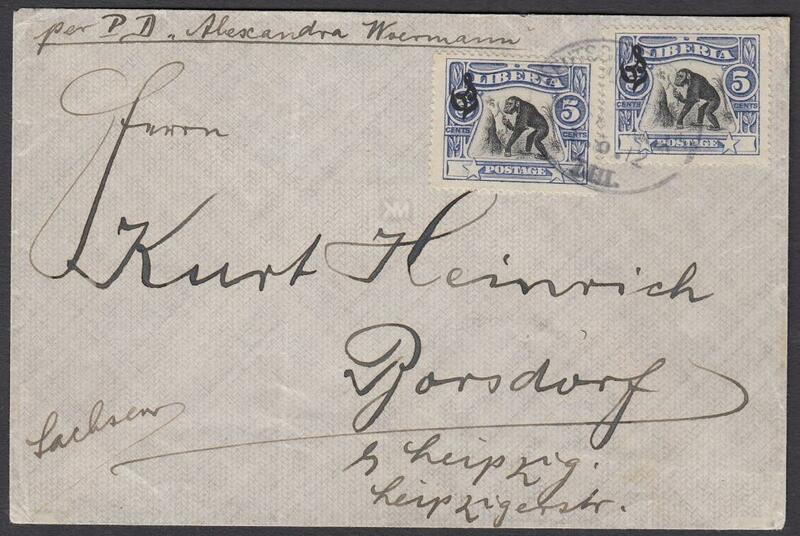 'MONKEY' tied oval 'DEUTSCHE SEEPOST/LINIE/HAMBURG/WESTAFRIKA/XXXI' date stamp; arrival backstamp. 1912 cover to Germany endorsed "per Alexandra Woermann" bearing multiple franking 5c. 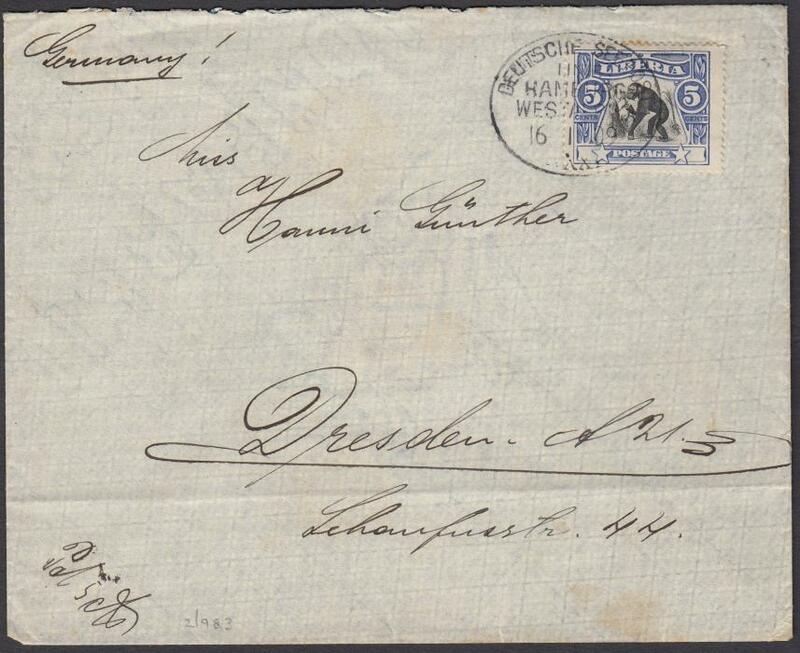 Monkey tied oval 'DEUTSCHE SEEPOST/LINIE/HAMBURG/WESTAFRIKA/LIII' date stamp. 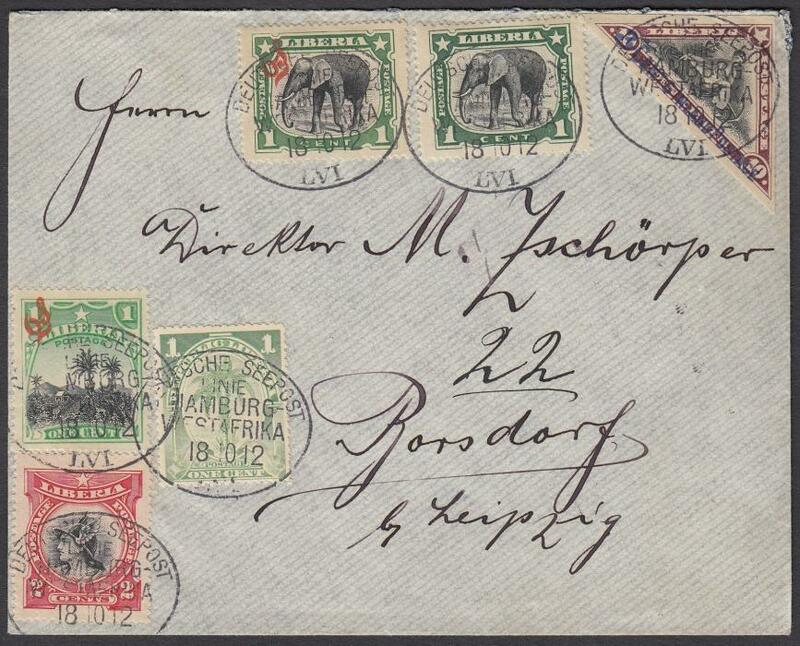 1912 cover to Germany endorsed "pr Kamerun" with adhesives, a mixture of postal and official issues tied by oval 'DEUTSCHE SEEPOST/LINIE/HAMBURG/WESTAFRIKA/XXVI' date stamps. 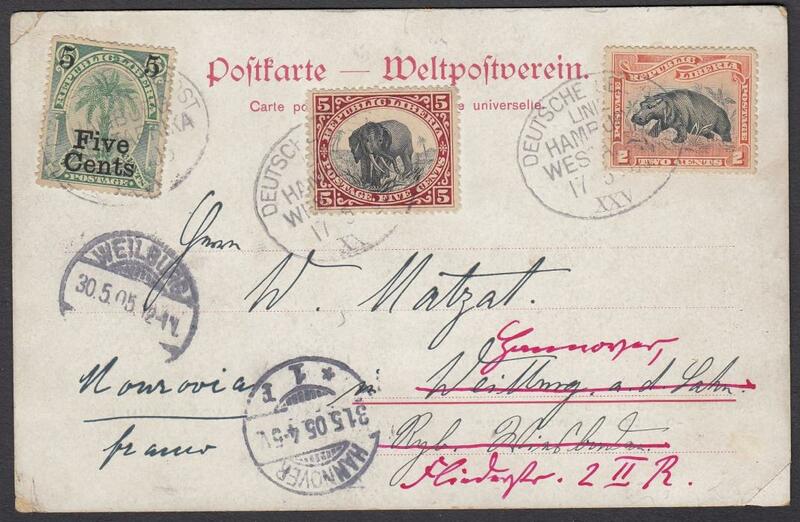 1912 cover to Germany with multiple franking each tied by oval 'DEUTSCHE SEEPOST/LINIE/HAMBURG/WESTAFRIKA/LVI' date stamps. 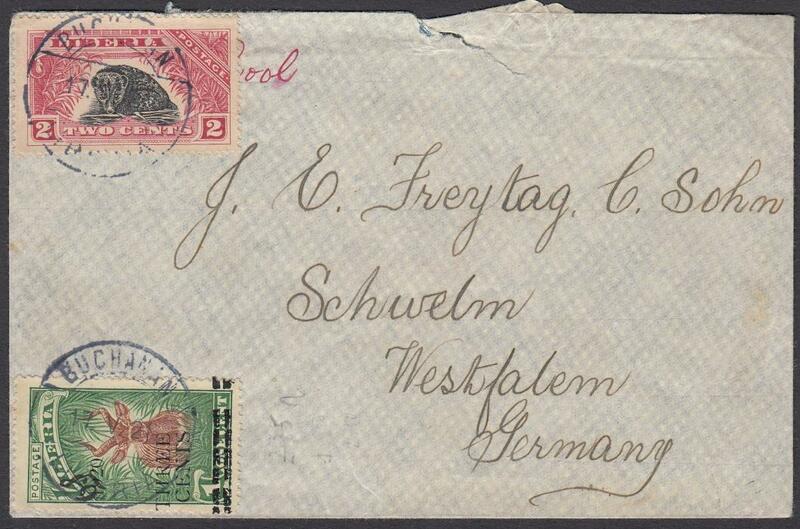 1921 envelope to SCHWELM, Germany franked 2c. + 'Three Cents' on 1c. cancelled 'BUCHANAN' date stamp. On reverse 'FREETOWN/SIERRA LEONE' transit cds. 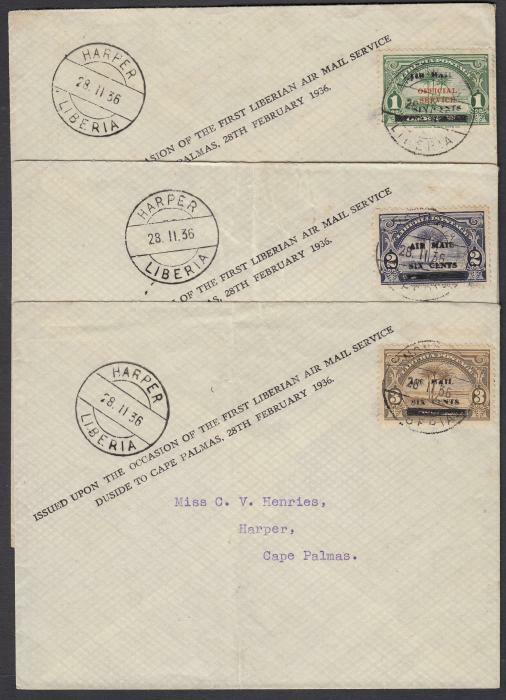 1936 'Provisional Airmail' issues set of three on individual covers bearing printed "ISSUED UPON THE OCCASION OF THE FIRST LIBERIAN AIR MAIL SERVICE/DUSIDE TO CAPE PALMAS, 28TH FEBRUARY 1936. ", each with 'MONROVIA' despatch and 'HARPER' arrival. Fine and rare.